Say bye to lingering lint. A smooth, taut, and textured poly-blend fabric wipes away water without leaving lint behind. Dries and buffs your crystal to a dazzling finish! Machine washable. Whenever we have a "fancy" party and my wife wears her lip gloss, it gets all over the rims of the crystal from which she drinks. It doesn't come off with soap and water, and it doesn't come off with alcohol or nail polish remover. Does anyone know of a way to get lip gloss off of crystal wine glasses with having to use an abrasive? The best way to clean lip gloss from the stemware is to hand wash them carefully with a cloth or brush. Cheap vodka on a sponge and a bit of rubbing. 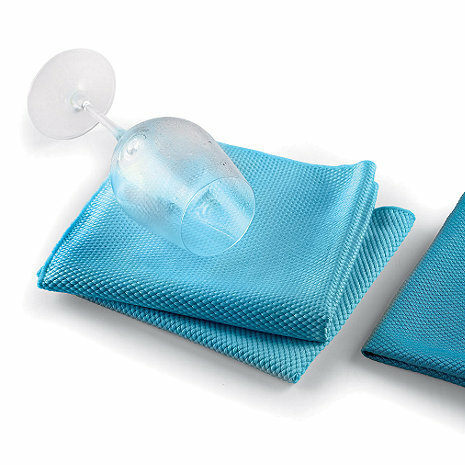 These polishing cloths look attractive and are well made but leave an incredible amount of lint behind on the glass. They might suffice for polishing crystal candlesticks or other things you're not going to drink or eat out of, but for wine glasses and other barware they don't cut it. Unless you like to eat lint. Knowing what I know now I would not have bought them. I returned immediately as the towels left tiny micro fiber elements all over the glass. If there is a process to remedy that due to being brand new, those instructions are not included. To dry wine glasses used at home. Leaves no residue or lint. Good absorption, dries crystal very well without leaving lint or scratches. It does exactly what it is advertised to do. Glasses shine when dried with this product. i have always wanted to buy these but just did not feel like taking the time to order separately. so I finally took the plunge when I was ordering some other gifts items. I love them. worth the cost - work great, finally, I know that I can wash a glass w/o any special soap & have no spots. Finally, a drying towel that works! ...until these Wine Enthusiast towels! They dry the glasses to a spot-free shine and leave zero lint! I highly recommend these towels to my fellow wine enthusiasts! OUTSTANDING PRODUCT. WORKS PERFECTLY; GLASSES ARE CLEAR AS CAN BE AFTER USING! Delivery was as promised. What a concept! Glasses shine like brand new! Our wine glasses sparkled better than brand new! No streaks at all! Quality polishing cloth, with great absorbtion. Polishes with no spots. Cloths are great. Really shine the glasses. I used this product to dry our good wine glasses, and the glasses were spotless in a hurry. And no lint!! These towels are perfect for getting glassware spot-free. Best used when stemware is still wet for drying and spot-cleaning. If they do get too wet though, they become a little difficult to use, but should be fine for the average home stemware use. Only one color choice - turquoise - which sticks out like a sore thumb on the towel rack in my kitchen. Works on up to 8 large glasses before it's too wet to do the job so make sure you buy enough for the biggest drying job you'll have. Does what it promises - lets you dry glassware without leaving lint and leaves it looking crystal clear. The towels dry wine glasses just fine. I have not yet washed them, so I don't know how they will work after washing. One small quibble--the tag on each towel is larger than need be and gets in the way. These are by far the best towels for drying crystal. They leave no lint behind, and crystal dries shiny and streak free. They're lightweight and pliable and can be easily stuffed into the wine glass; twist the towel around a few times and the glass is dry. Don't know yet what effect washing will have on it. I have tried these on several kinds of glasses, including several brands of lead crystal, before AND after washing the towels -- some of which I put through the dryer and others I allowed to air dry. Nothing helped. They DEPOSIT lint on the glasses. The glasses are nice and streak-free but who wants a mouth full of lint with their wine? We have been looking for something that will dry wine glasses and leave no lint or spots and this is it. Glad I ordered 4. These really work must have for any wine lover!!!!!!!! Best towel for wine glasses. Mine are now spot free. And is very gentle. what every host and hostess ned for sparkling glassware. No more iffy glassware with this towel. All of your drinks will look better in a sparkling glass. Why take a chance..... get the best!! I love the microfiber towels. No lint!! Will definitely order more. Love these towels. The first set has worn out from use but they were also purchased a long time ago. I’ve used lots of towels to dry my wine glasses and these are the best. I highly recommend these towels especially if you have soft water. I have found that I have to rinse my glasses a long time to rinse out the soap residue. These towels then completely remove any water spots left. Excellent for drying my Marquis by waterford lead crystal snifters. Would definitely recommend. best towels for glasses, ever! have tried others...linen, microfiber etc. these are by far the best. they dry well, and make glasses sparkle! The glass towels perform just as advertised --clean, no smear/smudge, or lint left behind. Love them. Very pleased with Microfiber Wine Glass Towels. They result in a crystal clear sparkling glass. Would definitely recommend this product. I have purchased many different towels over the years and I feel these are the best. nice surface composition removes drip marks when glass is moist, not dry! These polish up your glassware to an amazing sparkle! I use the micro cloth in conjunction with the wine glass cleaning brush set and the wine drying rack every time I clean my wine glasses which is of course after every use. Have tried microfiber cloths for years and non compare to these. They not only leave wine glasses sparkling and lint-free, but also work great on glass cabinet doors, mirrors, flatware, and windows, whatever you want streak-free and spotless. Shines glasses great with no lint at all! Besides our wine glasses, for which it is ideal, I use this every day after I take a shower. Our water in this neighborhood is very hard. If we leave it to dry on it's own it will leave terrible water spots. After I shower, I use one of these towels to wipe down the glass doors and marble walls of our shower. We now don't worry about spots that can become nasty stains. Took so long to arrive, like weeks. I thought the order didn't go through so I ordered them again. Like 2 boxes. When I called customer service to return them they wouldn't send me a return label which meant I would have paid the postage. Terrible customer service and I have never had a problem where they gave me no satisfaction at all. Very abrupt. I used these towels to dry my wine glasses after washing in warm/hot soapy water. I was amazed how the glasses now sparkle. I also used the towels on other crystal and glass items for a clear, lint-free shine. Excellent poduct! Works as described. Dries glassware with no smears. These are a bit small when using with the WE Fusion Cabernet glasses...I have to use two clothes to hold the outside with one and wipe the inside with the other. I've washed them once and there is still lint coming off. I've found others that work better.